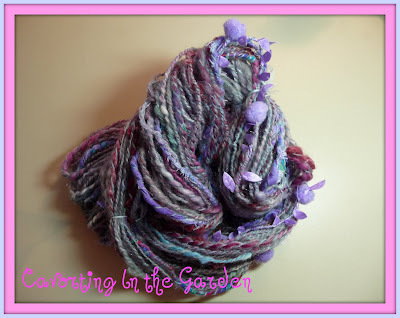 I've noticed that some of the artsy spinners were incorporating dyed silk cocoons in their yarn, and I was excited to see what I could come up with, not really wanting to copy them exactly. I was looking for a way to put my own whimsical stamp in the idea. I hand painted the cocoons with silk dye, then cut and shaped them, nesting the halves to give them a little more personality. It was a blast, I need more cocoons, I have a lot of ideas for creating fun spin-ins with them. 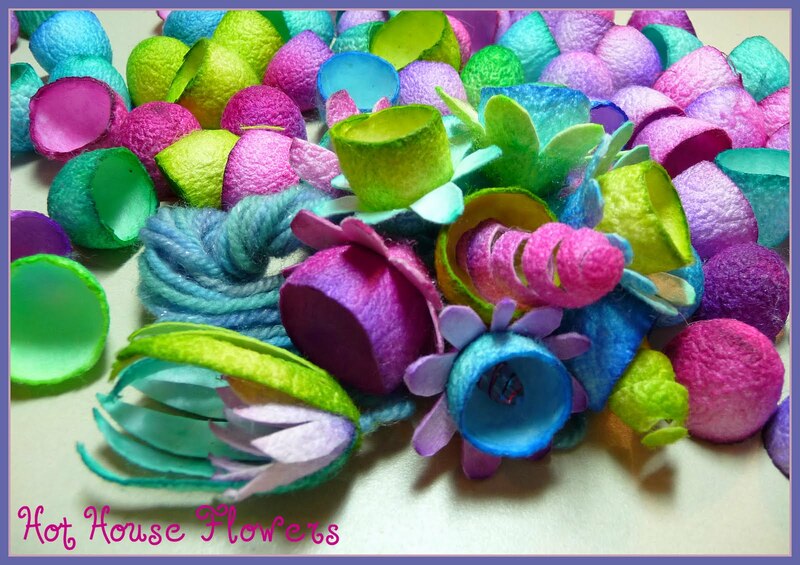 This cute little bunch of flowers is ready to spin into some special yarn! Ok, so I have had this cuff floating around for a couple of years by now. It came from this really cozy denim shirt, which was perfectly broken in, but it needed taking in before I could continue to wear it. I ended up making the sleeves 3/4 length and removing the cuffs entirely. But I just couldn't part with the cuffs. I knew that someday, when the time was ripe, I would do something with this cuff. So I moved it from work table to drawer, trying it on, then putting it aside again. Then recently a couple of Ravelry friends were talking about this awesome fiber artist. I had to check it out. To me her creations feel like a form of meditation, her spiritual journey. 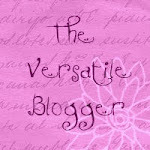 You can check her out for yourself here at her blog, Spirit Cloth. Her art really speaks to me in a language so completely familiar. Exploring her work for a few days has really had an impact on me. 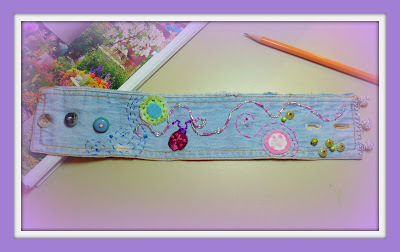 The other night, soon after I had turned in for the night, I jumped out of bed with a really great idea, I would embellish my old denim cuff. Thing is, I had to find it, turns out it was right where I put it last. Ha ha ha! I knew I wanted to try my hand at applique, I love working with little snips and bits. I added one of my favorite trims, the wire beads on a chain, just a little sparkle in my favorite shape, round. Then came the curly, twirly lines. A ladybug, one of my symbols...I'm a little rusty on my satin stitch, but I don't mind how it turned out. I considered if I should completely fill the surface with embellishment, then decided to allow this to be a work in progress. I can add details as I go along, when the time is ripe for more decoration. Hope you are having a wonderful, creative week! Blessings Friends! I've been working on this coiled yarn spinning technique, and I think I am finally at the point were I can make a fairly consistent coiled yarn. 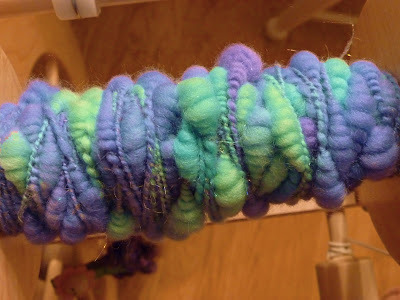 Here's my yarn on the bobbin, I started this last weekend at a spinning retreat held by a fiber guild I belong to. I took my time with the technique, it was slow going at first, but I was able to pick up a little speed as things progressed. I finished plying the rest of the bobbin at home the next day. I'm happy with my progress, I love the chubby coils in this beautiful colorway. 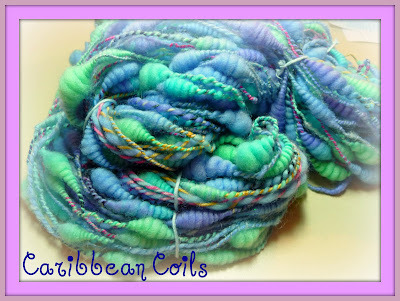 I was pleased that my coils stayed intact after the yarn was washed and the twist was set. There were a couple that needed some TLC in the way of reshaping, I could see that I hadn't anchored those coils properly to the core yarn, so they scooched around a bit during their bath. 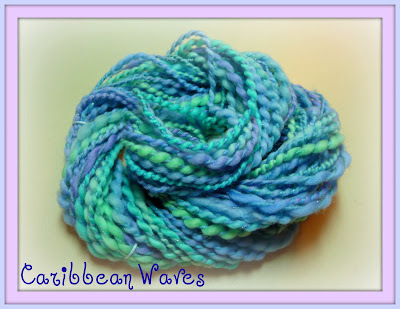 Using the same roving, I spun up a little skein of waves to go along with the skein of coils. Yum, love those colors! Hope everything's going great for you! Blessings Friends! I've been in a real spinning groove lately, I'm inspired by all the delicious art yarn techniques I've seen, and I want to master them myself. I'm honing in on the coil thing, it's been a process of reading/practicing the various techniques out there in spin-land, and then play, play, play...I mean practice, practice, practice. I've got plenty of tweaking to do for this technique, for starters if I want a smooth coil, I'll choose a smooth roving to spin, and in my next try, I'll space them closer together. That being said, I love how this turned out and I wish I had more of the fiber. 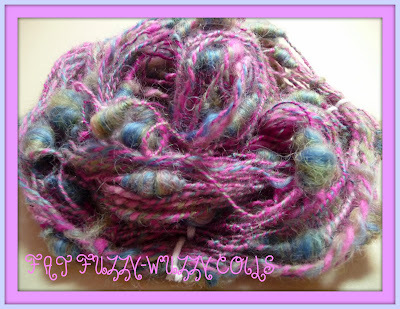 I love those fat fluffy coils contrasting with the skinny hot pink plied section, it's just fun! I included a lot of spin stuff in this blend. 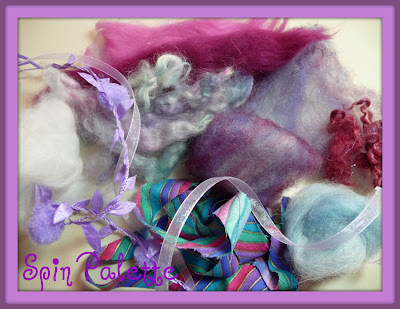 I really let myself gather together a bunch of different fibers, textures and colors. 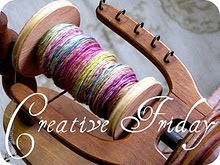 In spinning, as in life, I want it all, I like a full palette! I'm so excited to knit with this goodie, I think it would make a fun bag/purse! It's springtime and things are bustin out all over, I love this time of year!